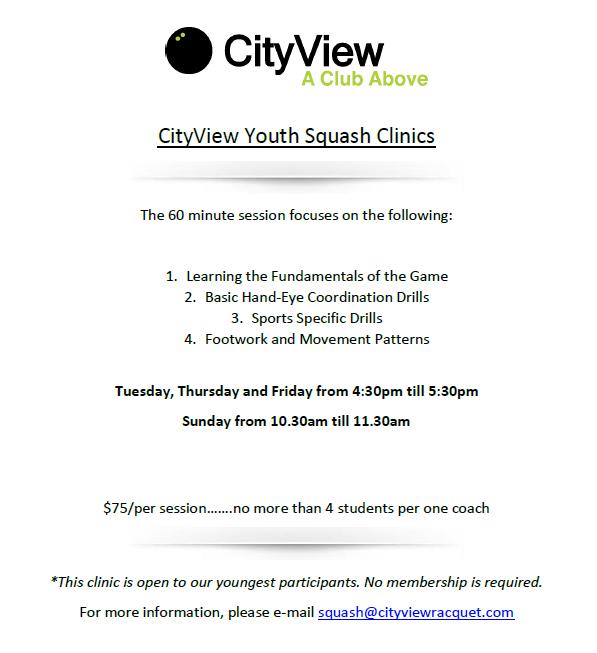 This introductory package is for first time players who are looking to get familiar with the game of squash. The player will learn basic hand-eye coordination and technical fundamentals, including grip, swing and basic movement patterns. Squash membership is waived during the 30-day period. 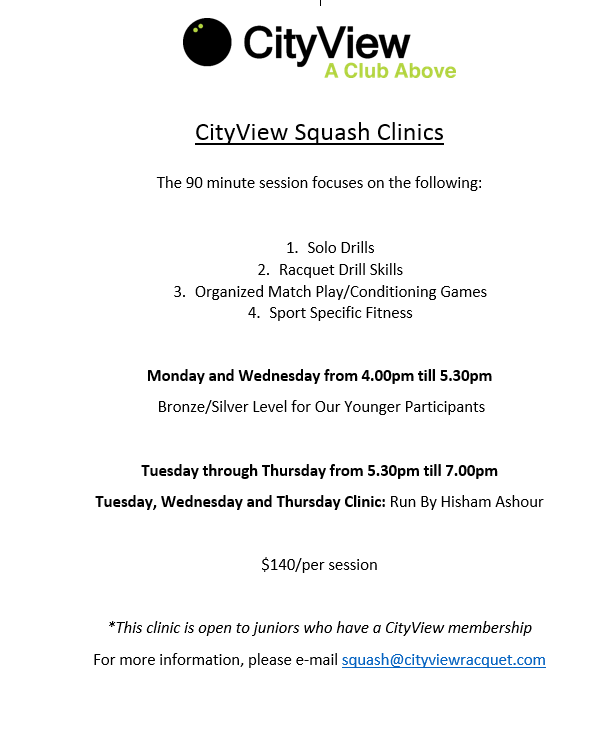 Our youth program at CityView primarily focuses on making the sport of squash fun and exciting. We believe in developing athletes from a young age. We focus on basic hand-eye and coordination drills, sports specific drills and games. Students become familiar with technical fundamentals, including grip, swing along with footwork and movement patterns. We utilize squash balls that bounce higher, move faster through the air and are easier to hit. By using this format, the benefits are immediate and within a short time kids are rallying, playing, and excited to keep playing. Our talented and experienced instructors use creative and competitive games to teach foundation skills in a fun and creative environment. A group class setting intended to be the core training method for Juniors. The 90 minute session includes drills, racquet drill skills, organized match play/conditioning games and Sport Specific Fitness. We strictly enforce a 24-hour cancellation policy. If you need to cancel your child’s scheduled lesson, please do so by e-mailing the Front Desk at: frontdesk@cityviewracquet.com. Please note that we DO NOT accept verbal cancellations.